Turmoil at the burger chain has been simmering since at least the summer. Jack in the Box (NASDAQ:JACK) franchisees are all wound up, charging that the burger chain's CEO is no crackerjack and asking him to resign. They also want the board of directors to replace a number of other people on the management team who have contributed to the restaurant's lackluster performance and the destruction of the brand's value. The dustup, which follows a no-confidence vote at the National Jack in the Box Franchisee Association (NFA) annual meeting this past July, has attracted the attention of activist investor Jana Partners, which established a 7.3% stake in Jack in the Box earlier this year. The hedge fund has sided with the franchisees, telling Bloomberg, "We share the franchisees' concerns about Jack in the Box's performance and the lack of urgency in addressing it." Although revenue was down 23% year over year in the fiscal third quarter, to $188 million, that's more a function of the refranchising underway at the chain. Refranchising is the sale of company-owned stores to franchisees. Of the 2,241 stores in the Jack in the Box system, 94% are franchisee-owned. The company sold 127 restaurants to franchisees in the first three quarters of fiscal 2018 and expected to sell eight more in the fourth quarter, completing the refranchising program. One of the main problems for Jack in the Box has been poor product development, which has led to few return trips to the restaurants. Comparable-store sales returned to positive territory in the third quarter, but rose just 0.5%. In comparison, McDonald's has reported comp sales growth for 12 quarters in a row, while Wendy's has seen same-restaurant sales rise for 22 consecutive quarters. In particular, franchisees cite poor performance with Jack in the Box's Food Truck sandwiches, Pork Belly BLTs, and Smoky Jack burgers. The NFA says these product missteps have caused Jack in the Box restaurants to fall "way behind" on their goal of achieving average unit volumes of $2 million by 2020. Jack in the Box has been one of the worst-performing stocks among quick-serve chains this year, with the stock down 16% in 2018. Jack in the Box Relative Stock Performance, data by YCharts. The NFA says that it has attempted to relay the concerns of its membership to Jack in the Box's management, but that the company has refused to engage on its requests and suggestions for improvement. As a result, they now have a list of actions they want the board to take, including dismissing CEO Lenny Comma, appointing a replacement who has "strong and effective experience and demonstrable success," and appointing a chief marketing officer who is qualified to create a cohesive vision for the company. Jack in the Box has no CMO at the moment, and the NFA says that those who have held the position in recent years didn't have the requisite experience for a chain the size of Jack in the Box. Management contends that it has worked with the franchisees, saying, "We have always been open to their constructive feedback and have worked to address any legitimate concerns." Yet with general and administrative spending falling from 3.8% of sales in 2015 to 1.8% of sales this year, the NFA feels management is reducing its support for franchisees, particularly in training. The franchising association represents about 2,000 restaurants in the system. It's clear that the two sides don't see eye to eye in this. 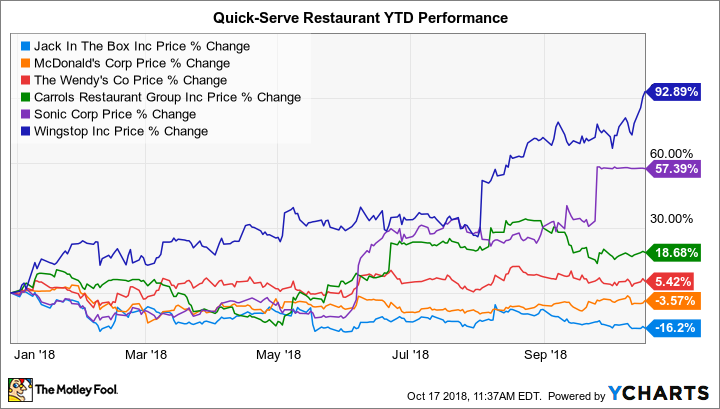 With an activist investor on the scene that was already focused on Jack in the Box as an undervalued investment opportunity, a shake-up could be imminent and end up reversing the burger restaurant's long slide.